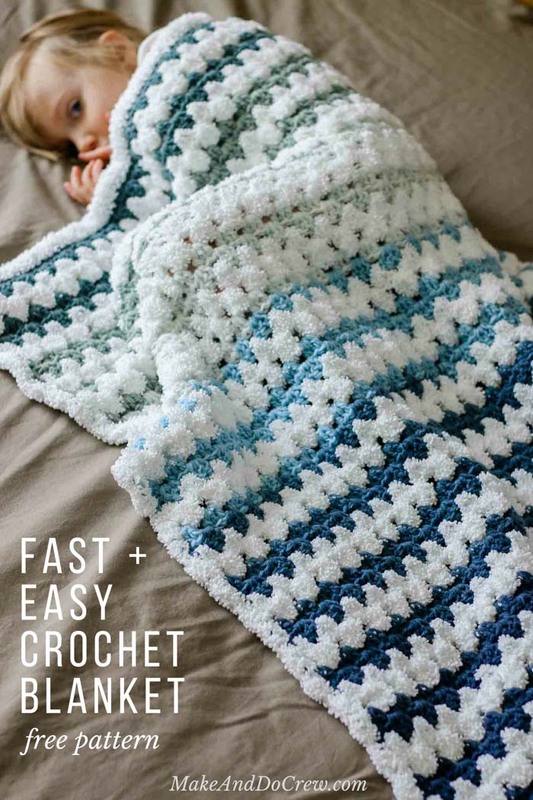 Learn how to make a beginner crochet baby blanket with this easy free pattern and tutorial. You’ll be left with very few ends to weave in and a blanket that’s as soft as a baby’s…well, you know. Get the full free pattern below or purchase the ad-free, printable PDF for $2.75 here. 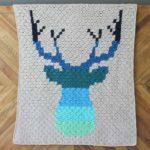 This beginner crochet baby blanket pattern is part of a collaboration with my friends at Lion Brand Yarn. This post contains affiliate links. A few months ago when I was visiting Lion Brand in NYC, I got my yarn-lovin’ paws on some skeins of a new yarn called Baby Soft Boucle and guys, this stuff is some serious kind of soft. It’s so fluffy and pillowy that it’s really what I imagine babies would crochet with if their little hands could manage. The one tricky thing about yarn that’s as magical and fluffy as Baby Soft Boucle though is that it can make it harder to spot your crochet stitches. (Knitting is no problem!) When working several swatches in this yarn, my conclusion was that it was best used for a pattern that was worked into spaces rather than the stitches themselves. Enter the good ol’ granny stripes! I felt like the texture of Baby Soft Boucle is best appreciated with a little lower-loft contrast and luckily, Lion Brand just released a new line of Mandala yarn called Mandala Baby. It’s still a 100% acrylic, category 3 (DK weight) yarn with a whopping 590 yards per skein, making it a perfect affordable compliment to the Baby Soft Boucle. Even better, two strands of Mandala Baby (or the original Mandala) held together match the gauge of Baby Soft Boucle quite well. This gradient cloud-fest was meant to be! 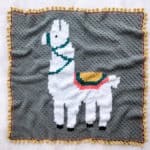 This is a pattern that really benefits from having the brands of yarn used in the sample, so I’m thrilled that Lion Brand has put together a kit for us. This kit includes all the yarn you’ll need, plus a printed copy of the pattern. You can even order a different color of Mandala Baby if blues aren’t your thing. See all the color options here! • The stitch is super easy and the thicker yarn makes it work up very quickly. • The fluffy Baby Soft Boucle disguises mistakes beautifully. • And because you don’t have to cut your yarn at the end of each row, there are very few ends to weave in when you’re finished! 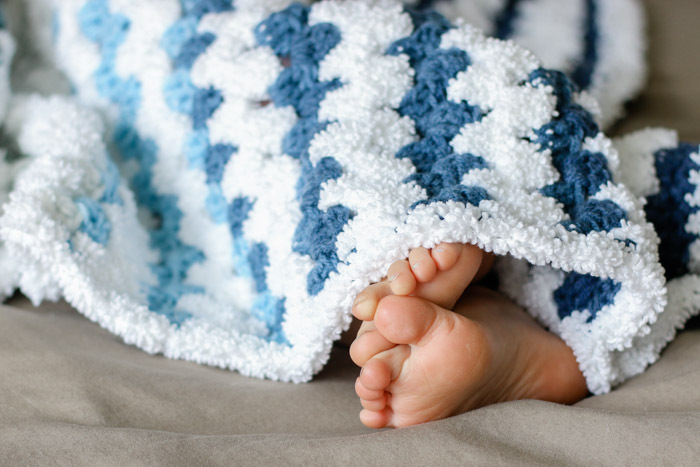 Since this beginner crochet baby blanket pattern and tutorial is so easy, it makes a fantastic last-minute homemade baby shower gift or a great charity project. (See my list of wonderful yarn charities here.) 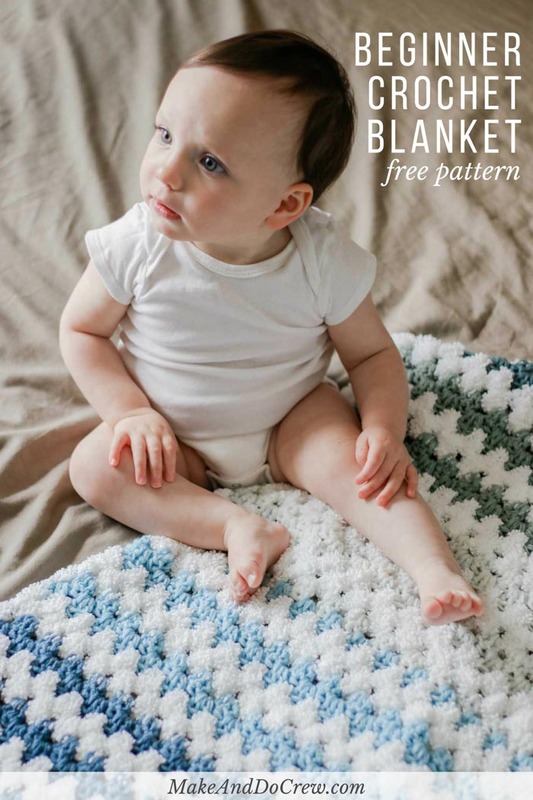 Lion Brand Baby Soft Boucle and Mandala Baby both come in so many amazing colors, you can really make any version of a girl, boy or gender-neutral baby blanket your heart can dream up. Save this to your Ravelry queue or favorites here. 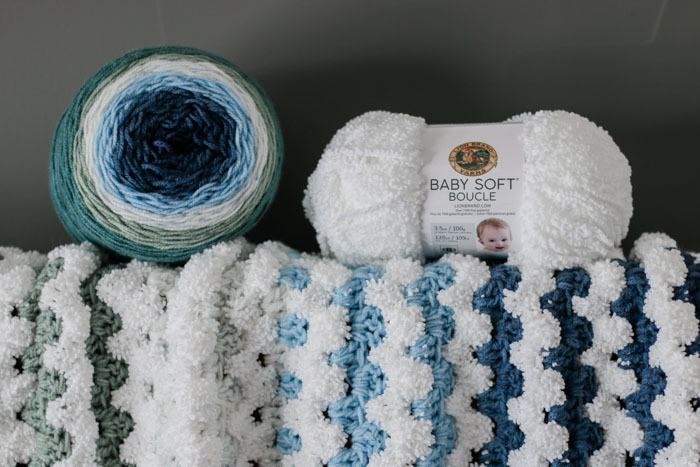 By combining luxuriously-textured Lion Brand Baby Soft Boucle yarn with your favorite shade of Mandala or Mandala Baby, you’ll create an extremely soft, machine washable and visually-stunning baby blanket in no time. Because the self-striping Mandala does most of the color work and you don’t need to cut your yarn at the end of each row, you’ll be left with very few ends to weave in and a blanket that’s as soft as a baby’s…well, you know. 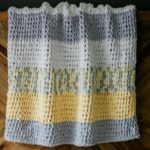 This pattern is quite easy and works up very quickly, making it great for last-minute baby shower gift or charity donation. While gauge is not critical to the execution of this pattern, getting it correct is what will ensure that 2 skeins of Mandala Baby create a square blanket. • Original Lion Brand Mandala or Lion Brand Cupcake yarn can be substituted for Mandala Baby in Color A. • Two strands of Mandala Baby are held together throughout. Only one strand of Baby Soft Boucle is used at a time. • Do not cut yarn at color changes. Instead carry it loosely up the side of the blanket. The final border will cover any carried yarn. Similarly, crochet over yarn tails whenever possible to avoid weaving them in. • To change colors between rows, complete the final yo of the last dc of the row with the new color. Pattern is written with the assumption that the last dc before a color change will be worked this way.If you’d like a different size blanket, chain a multiple of 3 and add 2 extra chains. Foundation Row: With two strands held together of Color A, ch 89. Row 2 (Color A): Ch 3, 2 dc in first sc, *sk 2 sc, 3 dc in next sc; rep from * until 3 sc remain, sk 2 sc, dc in last sc; turn. Switch to one strand of Color B. Row 3 (Color B): Ch 3, 2 dc in first sp, 3 dc in each sp between clusters to end of row, dc in top of tch; turn. Work in pattern of 2 rows of Color A alternating with 2 rows of Color B to rep Row 3 (54) times until there are a total of 57 rows including Row 1 of single crochet. Row 57 should be worked in Color A. Row 58 (Color A): Ch 1, sc in each dc to end of row. Attach Color B anywhere around edge of blanket. Border: Ch 1, sc in each sc st along top and bottom of blanket and sc evenly along sides, sl st to first sc of round to join. If sides ripple, decrease total number of sc along each side. 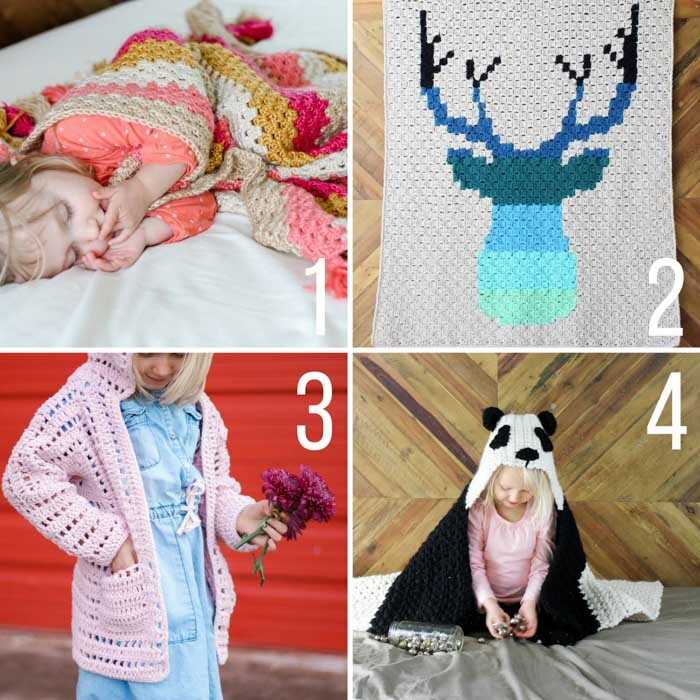 WANT MORE FREE MODERN BLANKET PATTERNS? 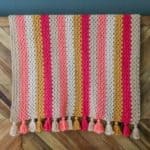 I'd love to send you more simple crochet afghan patterns that will make you feel like homemaking hero! You in? « Introducing the Alchemy Cardigan Crochet Along 2018! Hello! 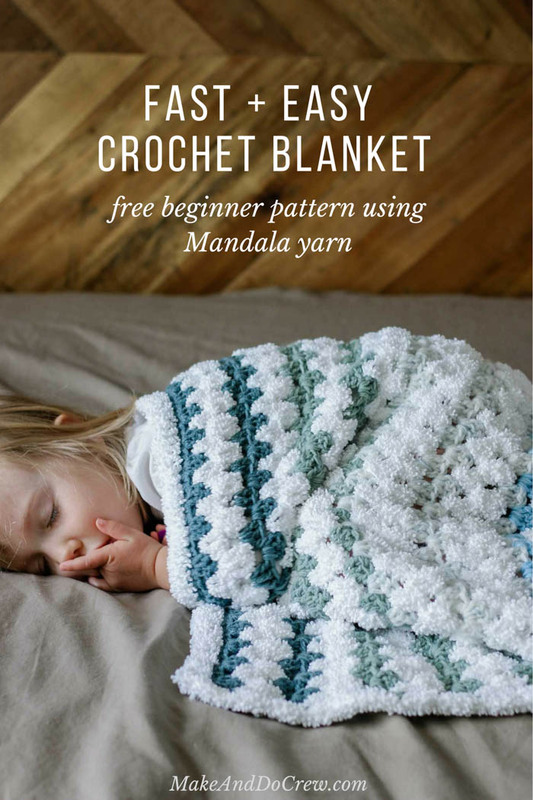 I am wondering what the difference is between the Mandala Baby and regular Mandala – is it jus the colour choices or is there a different feel to the yarns? It’s just the option of more colors! 🙂 So many of them are really pretty in both lines of yarn. This is beautiful! If I were to do a longer length blanket, should I buy more yarn? Yes! You can use the stitch multiple in the pattern to make it wider as well. Hi! I just bought the crochet kit from Lion Brand and excited to get going. However, I’m still pretty new to crocheting and have a potentially obvious question. The pattern says to hold two strands of the Mandala Baby together, but when I do this the two strands are different colors. I’m using one strand from each skein and the colors are distributed differently for each skein. What am I doing wrong? When using the two strands, should they rub with same color? My rooms start and end with different colors. Hello again – I have another question from a beginner 🙂 Do I understand correctly that you need to use two strands together of the Mandela yarn? In which case, do I need to match up the varigatied colours at the start so the two balls of yarn match up? Does my question make sense? Many thanks! Are the measurements really 5′ x 35″? This seems long. I absolutely love this pattern! I make baby blankets for Project Linus and am always in search of a new pattern so I was delighted to find yours as I already had these yarns in my “ stash “. I am not on my third one!!! The two yarns make lovely blanket. Thank you for searching your gift. Many blessings to you! That is so nice to hear that you make blankets for Project Linus. What a special cause! And even better that you already had some of the yarn! Thank you for your kind words, and the work that you do to help kiddos! Hi, I’m from Brazil and I’m in love with your blog! Since speaking English is not my strong side 😂 I have some questions regarding abbreviations. Hi Clarissa! That is a great question. I’ve been crocheting for a while but in truth I’m still a beginner when it comes to reading a pattern vs step by step photos or a video. I love this pattern and the mix of textures but I’m still having trouble following how you are switching between the color and the white. Are you cutting the white in between the rows and weaving it in or are you carrying it on like the color? I wish you had a video tutorial showing that switch. If you’ve never switched colors before, take a look at this pattern. There’s a video tutorial where I show exactly how to switch colors at the end of a row. Hope that’s helpful!